Supergirl fans were left with a big reveal in the fall finale Hostile Takeover earlier this month, when David Harewood's Hank Henshaw revealed that he was none other than the Martian Manhunter. With the holiday hiatus winding down, the series is getting ready to return with the midseason premiere Blood Bonds, with CBS releasing a trailer featuring new footage. The video offers our first brief glimpse at a new character, the DC Comics villain Non, portrayed by Chris Vance. In Blood Bonds, Astra (Laura Benanti), the evil twin sister of Kara's mother Alura, is being held in captivity at the DEO. Her husband Non has captured Hank, leading to a tense standoff between the two sides. Kara also continues to refute Cat's allegations that she is Supergirl. We see in this new trailer that Cat believes, "beyond a shadow of a doubt," that Kara is in fact Supergirl. This trailer also hints that Toyman will be introduced in the midseason premiere. In the DC Comics, Toyman was also known as Winslow "Winn" Schott, portrayed in the series by Jeremy Jordan, but since the show threw fans a curveball by turning Hank Henshaw, a.k.a. Cyborg Superman in the comics, into Martian Manhunter, it's possible that a different character could be taking up the Toyman mantle. Melissa Benoist leads the cast of Supergirl Season 1 as the title character. 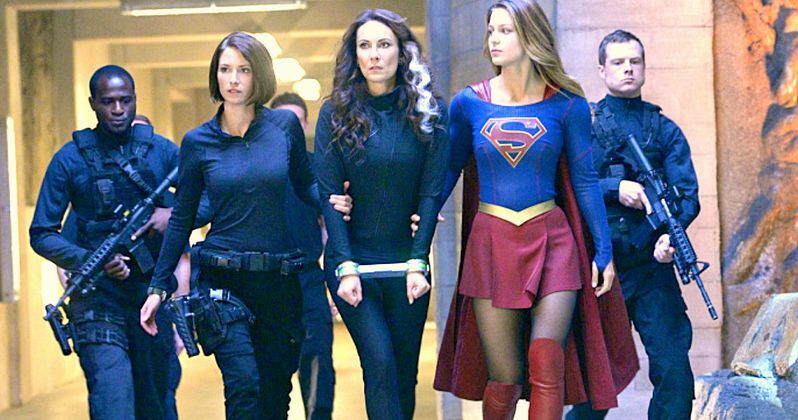 The show also includes Mehcad Brooks as James Olsen, Laura Benanti as Alura Zor-El, Calista Flockhart as Cat Grant, Chyler Leigh as Alexandra "Alex" Danvers, Jeremy Jordan as Winslow "Winn" Schott, Jenna Dewan Tatum as Lucy Lane (sister of Lois), David Harewood as Hank Henshaw, Peter Facinelli as Maxwell Lord. Dean Cain and Helen Slater play Kara's adoptive Earth parents. Blood Bonds is set to air on Monday, January 4 at 8 PM ET on CBS. While there are certainly no shortage of villains for Supergirl to do battle with in National City, her rogue's gallery is getting even bigger in the New Year. Chasing Life star Italia Ricci has signed on to play DC Comics villain Siobhan Smythe, a.k.a Silver Banshee, in the hit CBS series. The actress will make her debut in the 14th episode of Supergirl's first season, which doesn't have an air date quite yet. We also reported earlier this month that Bizarro will also be introduced in the back half of the first season. The actress joins a growing list of guest stars including Peter Facinelli (Maxwell Lord), Chris Browning (Reactron), Jenna Dewan-Tatum (Lucy Lane/Superwoman), Chris Vance (Non), Iddo Goldberg (Red Tornado) and Brit Morgan (Livewire). We reported last month that CBS issued a full season order for Supergirl, extending its first season to 20 episodes. Take a look at the new trailer for Supergirl's midseason premiere, Blood Bonds, before it debuts next week. Is Man of Steel 2 Bringing Supergirl Into the DCEU?